An aneurysm is defined as an abnormal dilatation of a blood vessel by more than 50% of its normal diameter. An abdominal aortic aneurysm (AAA) is defined as a dilatation of the abdominal aorta greater than 3cm. In the UK, around 1 in 70 men over 65yrs have an AAA and over 3,000 deaths occur each year from a ruptured AAA. In this article, we shall look at the clinical features, investigations and management of abdominal aortic aneurysms. The aetiology of abdominal aortic aneurysm is largely unknown. Possible causes include atherosclerosis, trauma, infection, connective tissue disease (e.g. Marfan’s disease, Ehler’s Danlos, Loey Dietz), or inflammatory disease (e.g. Takayasu’s aortitis). Risk factors for AAA include smoking, hypertension, hyperlipidaemia, family history, male gender, and increasing age. Diabetes mellitus is a negative risk factor for AAA (the mechanism for this is still poorly understood). Many abdominal aortic aneurysms are asymptomatic and are simply detected on incidental finding or screening. On examination, a pulsatile mass can be felt in the abdomen (above the umbilical level), and rarely, signs of retroperitoneal haemorrhage may be evident. A patient with a ruptured AAA may present with pain (abdominal, back, or loin) and a degree of shock or syncope, as discussed below. In the UK, the national abdominal aortic aneurysm screening programme (NAAASP) offer an abdominal US scan for all men in their 65th year. Men screened for AAA have been shown to have an approximately 50% reduction in aneurysm-related mortality (albeit a limited influence on all-cause mortality), based on the Multicentre Aneurysm Screening Study. Around 1.1% of all those screened are diagnosed with an AAA, with 0.32% having an AAA large enough (≥55mm) to require direct referral for consideration of surgery. Most men with a detected AAA will spend 3 to 5 years in surveillance prior to reaching the threshold for elective AAA repair. The main differential diagnosis in patients who present symptomatically is renal colic, due to presence of back pain with no other symptoms present. Other abdominal pathology such as diverticulitis, inflammatory bowel disease, irritable bowel syndrome, GI haemorrhage, appendicitis, ovarian torsion or ovarian rupture, or splenic infarctions may also be possible differentials. 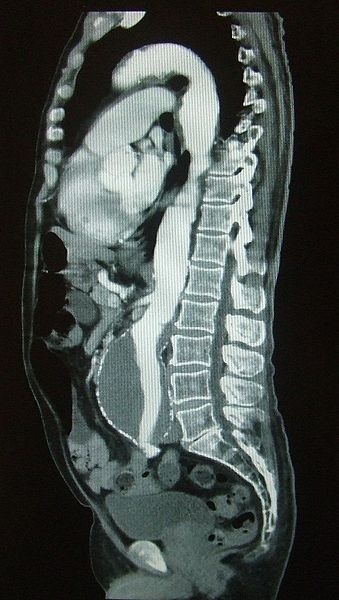 Figure 2 – CT scan showing an abdominal aortic aneurysm. Once an USS has confirmed this diagnosis, a follow-up CT scan with contrast (Fig. 2) is warranted when at threshold diameter of 5.5cm. This provides more anatomical details in order to determine suitability for endovascular procedures. *An AXR is not indicated as it will only rarely show an AAA if there is significant calcification of the arterial wall. *In the UK, any AAA >6.5cm requires notification to the DVLA and disqualifies from driving until repaired. Figure 3 – Endovascular repair of an abdominal aortic aneurysm. Surgery should be considered for an AAA >5.5cm in diameter, AAA expanding at >1cm/year, or a symptomatic AAA in a patient who is otherwise fit. In unfit patients, the AAA may be left until 6cm or more prior to repair, due to the significant risk of mortality from an elective repair compared to the risk of mortality if not repaired. Both open repair and endovascular repair have similar long term outcomes. Endovascular repair does have an improved short term outcome in terms of decreasing hospital stay and 30 day mortality, yet has a higher rate of reintervention and aneurysm rupture. After 2 years the mortality for both procedures is the same, therefore in young fit patients an open repair may be more appropriate . 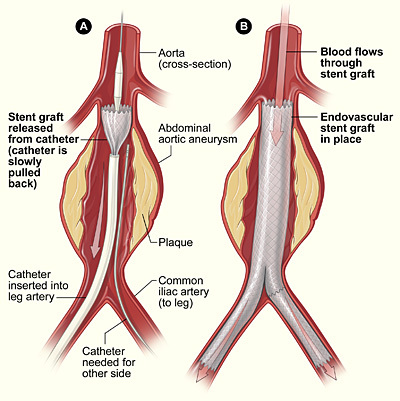 An important complication for EVAR is endovascular leak, whereby an incomplete seal forms around the aneurysm resulting in blood leaking around the graft. Endoleaks are often asymptomatic hence regular surveillance (usually ultrasound unless a complication is noted) is needed. If left untreated, the aneurysm can expand and subsequently rupture. As such, any aneurysm expansion following EVAR warrants investigation for endoleak. Type 3 A leak occurs through a defect in the graft fabric. 3a = separation of sections of the graft, 3b = hole in the graft. The risk of AAA rupture increases exponentially with the diameter of the aneurysm*, but the risk is also increased by smoking, hypertension, and female gender. An AAA rupture can present with abdominal pain, back pain, syncope, or vomiting*. On examination they will typically be haemodynamically compromised, with a pulsatile abdominal mass and tenderness. Around 50% patients present with the ‘classic triad’ of ruptured AAA (flank or back pain, hypotension, and a pulsatile abdominal mass). Any suspected AAA rupture warrants immediate high flow O2, IV access (2x large bore cannulae), and urgent bloods taken (FBC, U&Es, clotting) with crossmatch for minimum 6U units. Any shock should be treated very carefully. Raising the BP will dislodge any clot and may precipitate further bleeding, therefore aim to keep the BP≤100mmHg (termed ‘permissive hypotension’, preventing excessive blood loss). As long as the patient is cerebrating, the BP is generally adequate. The patient should be transferred to the local vascular unit, with the vascular registrar, consultant, anaesthetist, theatre, and blood transfusion lab informed. *The IMPROVE trial randomised patients suitable for EVAR or open AAA repair, showing no 30 day or 1 year difference in survival, but an increase in patients returning to their own homes, short hospital stay, and lower cost in the EVAR cohort. The 3 year results show a significant survival benefit for EVAR, particularly when performed under local anaesthesia. A routine screening US scan in an asymptomatic male patient reveals a 4.3cm abdominal aortic aneurysm. What is the appropriate interval before a follow-up US scan? 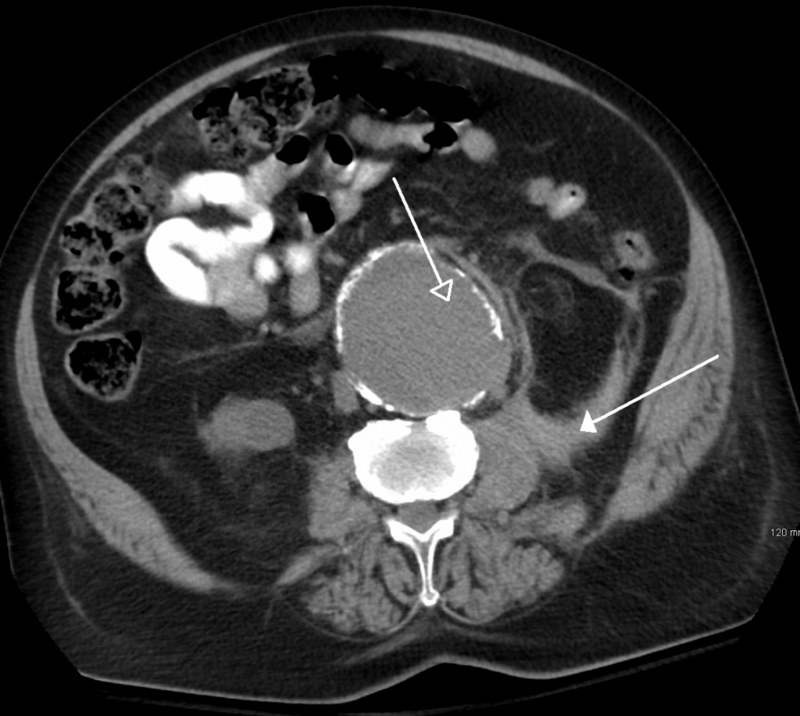 Severe abdominal pain and an abdominal pulsatile mass is an indication of which of the given conditions? Which of the following diagnostic imaging tools is the standard first-line for AAA?